Technology is ruining our society??? and immediately come to the worst of conclusions. Technology is making us all anti-social, and as we stare down at the blinding screen we dismiss the presence of others to stay in our own technological bubble, and it’s ruining our society. Premise One: Technology is becoming an addiction in our society. Premise Two: Our addiction is pulling us apart from each other. Now, lets actually look at the argument for Factual Correctness. From these quotes, it’s clear that the DSM only defines internet gaming as an addiction, (at least at the moment,) as there is not sufficient data yet to say that excessive use of social media or other forms of internet entertainment can be classified as addictive, despite the common myth that there is an agreed on criteria for diagnosing and evaluating them.There is also the criteria that normal obligations must be ignored. That is, there needs to be a lack of proper social functioning present to differentiate what is merely a strong passion, and an addiction. There also needs to be continued symptoms to count as an addiction – merely engaging in extended internet use once (say, for a friendly get-together,) does not count, even if it was for over ten hours per day. And that does not even touch on the growing populace of people who have turned gaming into their job, through lets play commentaries, tutorials, speedruns, and other gaming based tournaments. Gamebreaking has never been this profitable! Context must also be taken into consideration, when agitation and anger are being assessed. Is this anger always present, and paired with a lack of the ability to complete obligations? Or, is it fair to assume that many people would be angry upon being forcibly removed from an activity they were engaged with.All in all, premise one is factually incorrect, as technology as a whole is specifically excluded from the DSM, and even if it was not, there are currently no consistent and factual studies to say that the majority of people are addicted – and going by the criteria for what an addiction must entail (irritability when separated from the object of addiction, increasing need to be exposed to more of the object of addiction, and an inability to keep up on other obligations,) most people in our society are not facing addiction at all. Premise Two: Technology, social media especially, are designed as social. Their literal intent is to give people a means to communicate rapidly and comfortably. It gives users an outlet to connect with those that have similar interests, and gives them a social circle that understands them on a level those in their “real” life may not.The internet is also full of information, and with so much knowledge at the tips of our fingers, it’s not at all surprising that one would engage in technology during everyday life to enrich conversations or back up arguments. After all, that’s what we are doing right now with this project. Conclusion: the conclusion is as limp as a wilted piece of lettuce when faced with all the things that keep people apart beyond technology. Work and school have people using the internet to do their work, people are enjoying their alone time by playing video games, people are using the internet to be social, and, frankly, if the people around you do not treat you fairly, there’s someone somewhere in the world who will. You don’t even have to buy a plane ticket to see them. It’s still up in the air if we as a society really are “addicted” to the internet, or if it’s just become a part of everyday life. Frankly, I feel like it’s just something that has become an integral part of life, and that’s not a bad thing. I mean, remember that large scale power outage in August? There was no internet, no power, no technology. And yet, people managed to entertain themselves. They went shopping, they went on drives or walks or hikes, they read and painted and did puzzles. Unless it was too dark to do things, people were functioning just fine. But if the choice is there to do something online, then why not do it? It’s fun! Besides that, a lot of what technology is becoming is interactive, that is to say, where TV was once a soapbox for those lucky enough to get onto it, it’s much more viewer concerned now. Social media has as much of an influence on a show’s popularity as simple ratings do, and people have HUGE meta conversations about things they love. And people have power online! Anybody can say anything, which gives oppressed groups that were never given a chance on the soapbox the same grounds to speak on what matters to them as the historic oppressors do. So because of all of that, and even more things, I really can’t bring myself to consider the internet (and technology in general,) something we’re addicted to. Because it isn’t a problem, it isn’t stopping us from living life. It’s just changing how we live life, and I don’t believe for a moment that it’s changed for the worse. HI! My name’s Kiuko. It’s pronounced Q-ko. But since 70% of people I tell my name to can’t pronounce that at first, I will accept anything from Cuco to Cucumber to Yoko Ono. I some things I really like are pho, dogs and the occasional deep quote on Tumblr. In this blog post I am just going to rant about something that has been bothering me for a while now. Recently, I’ve been getting a lot of comments about my appearance. So basically you’re telling me to be confident and not self-conscious while judging me when I do things that I like/enjoy that make me feel less insecure and happy? We’re all human, we all have things we don’t like about ourselves, so why do you feel the need to judge someone when they are simply trying to feel better about themselves? Why do you care if I gained weight over the summer? Why do you care if I wear loads of makeup? Why do you care if I’m wearing a tank top and shorts? Why does it matter to you, and WHY do you expect me to feel happy with my body and the way I present myself when you make those comments about me. I was getting immensely worked up and upset about these comments until I realized. Why do I care about what you have to say about my appearance? Why do I care? Why should I care? It’s common sense really, that I don’t have to let anything anyone says affect me. Why did it take me so long to realize? Why did it take so long for everyone to realize that it’s okay to do what you want and block out the haters? But next time when you see someone rocking a really great outfit or an awesome makeup look, compliment them! Maybe, just maybe, if you keep up with it and if more and more people learn to do the same… society just might become a little less ugly. Hope you look forward to five months of just me ranting about stuff that bother me!! Peace out. Before reading the entirety of the post, keep one thing in mind: We are limited to the amount of ‘free will’ we have (or maybe we don’t have free will at all, depending on what you think) and it traps us. This plays a huge role in our topic. All of the factors listed above play a part in the road to murder. Society tacitly condones murder by having these factors. An example is boredom; when an individual is bored, and seeks to quell that boredom through murder, society punishes them for doing so. We forget that everyone is different, so naturally, what pleases certain individuals may not please you. We are brought up to think of murder as bad, but it could very well be just like any other interest. Many of us like to listen to music, watch movies, play video games, play sports and the like, so why is murder any different? Isn’t it because we were made to think that way? Society conditions a certain group of individuals into being the weak; for example, the blacks, the Jews, and First Nations are conditioned to be thought of as the weak. Society conditions Muslims, men, and terrorists in general to be thought of as the strong, because we fear these people and what they are capable of doing. Society can be categorized into three groups: the weak, the average, and the strong. Using a scale as an example, the weak and the strong are at the ends of the scale, while the average are at the middle. The weak and strong would be categorized at outliers, while the average are categorized as the majority. The strong category would include those with mental capacity and strength that is above average; physical strength; innovative and creative; influential and charismatic; those with interesting and unique ideas; and those with dreams that they are willing to sacrifice everything for to achieve. The weak include those who drop out of school; lose their jobs and homes (homeless); those who are considered “failures” in life by society; those who have no motivation or drive in life to achieve anything; those who are dependent on others even though they have full capability to be independent; those who are socially oppressed against their own will; and those who are physically or mentally disabled. Society seeks to prolong the survival of the average, the middle class which has the highest chance of survival. It ostracizes the weak and the strong, which leads to these two outliers feeling despair, and thus raising the chances of these two outliers committing acts of violence. These outliers are driven to taking revenge against the average for what society has done against them, in order to give them a sense of purpose which will encourage them to continue living. Society, in doing so, causing itself harm: if it did not ostracize these two outliers, it would not have to deal with the troubles caused by them. Remember, our ‘free will’ is limited or otherwise non-existent (depending on your belief), and therefore, the weak have no opportunities to bring themselves to power and the strong are typically alienated against their will. Thinking more in-depth about it, there have been numerous pieces of evidence that back our points up. Numerous studies agree that gifted children are more emotional than the average person; blacks and Jews have been kicked around for a good chunk of history; people of different sexual orientations are still being discriminated today. Some proofs that hit closer to home include: when we bear expectations of our hardworking peers and continuously praise them for their good marks, not knowing that it puts pressure on them; when some parents overlook the good and can only see the bad in you; when you have no say over anything because you’re just a child; when being gifted or being good at something automatically means other people can call you super smart and the fear of disappointing others overtakes you; when you are a certain religion, skin color, nationality, heritage, body size, etc. and you can’t do anything about it, but the media only brings the spotlight to men with “hot” bodies and skinny and tall women. Things like that drive us into a hole, and sometimes, it causes people to crack- to kill, even- and sometimes, the victim of this harm is ourselves. Therefore, in the interest of the greater good or benefit, society would benefit itself by caring for the two outlier groups in order to maximize the happiness of the average. John Stuart Mill, an extremely important British philosopher who lived in the 19th century put forth the Principle of Utility, or the Greatest Happiness Principle: “actions are right in proportion as they tend to promote happiness, wrong as they tend to produce the reverse of happiness”. In this case, society would be justified in judging the two outliers, in order to promote the greatest happiness of the majority. Even though these two outliers would undergo the opposite of happiness (pain), the majority of the average would benefit, therefore justifying these actions. However, through the lens of Kant’s Categorical Imperative, every human being should be treated as an end in itself. Therefore, society should treat each person in a way that benefits their inherent dignity as a human, and be given help to prevent them from sinking down to a level of violence. This view disagrees with that of Utilitarianism, because it does not condone using people as means. By treating everyone fairly, we would prevent a lot of the trouble that the justice and social system has to deal with. Anything not mentioned on the list above can be posted about, but please don’t direct arguments or discussions towards those points. Cultural Manifests, they are like the unifying purpose of a group, the nails, screws, bolts and washers holding a desk together, or the interworking gears of clockwork slowly ticking by. At first glance, a cultural manifest means nothing, it’s background noise; like the Jazz Mr. Jackson uses in philosophy to set the mood for discussion. Trying to examine a cultural manifest is like a fish trying to examine the water through which it swims (as we have oft referred to in class). The properties of a cultural manifest are what drives its society to progress. If they weren’t hidden, who would follow them? Would you prefer to listen to the underlying message in your favourite song, or the nagging authority of a guardian? We ought to listen to the guardian wishing us well, but we want to listen to our favourite song. A cultural manifest is often like your favourite song; it influences you through nuance and subtlety and can transmit messages so deep and so condensed that it would be nearly impossible to find all the influences and motives behind them. That is not to say that we are controlled and limited by cultural manifests, rather it is to say, like music, it can influence us in our decisions. To further clarify, cultural manifests are not the only mechanisms that influence decision making. Where the cultural manifest influences people with little or no variation, is where one of the many possible central ideals exist. As for the next few sections, they will be choice based and they will be numbered and listed below so that you may choose what to read. 1. Pertaining to the clockwork example mentioned earlier, a cultural manifest is much like a mass of clockwork. The main difference being that all the gears are tiny and may have nearly invisible effects on gears hundreds of meters away from them. The clockwork can be jammed by rocks in which case catastrophic events can occur. Gears can be replaced and the clockwork can continue functioning again, but it will take decades even centuries to undo the damage done by those rocks. Furthermore, someone who has analyzed and studied the mechanisms in the clockwork, knows how to create purpose from it, knows how to alter its varying functions and knows how to manipulate the clockwork to their ideals. A cultural manifest is much the same, it has no single goal or purpose, rather it is an asymmetric mash of powerful and incentive-based concepts. And whenever the group under this cultural manifest is put through a catastrophic event, the manifest changes, it adapts to the current circumstances and the emotions which are mixed within it. This can distort and alter its previous functionality and cause deficiencies within the system. One who can manipulate cultural manifests can convince almost anyone immersed in that one’s manifest that the ideals which are upheld by that manifest are just and right. If we are to examine to communisms’ modifications in Russia, we can clearly see that this idea/concept was placed into Russia’s construct/manifest of nationhood. When an idea or concept is placed into a culture/symbol, it influences everyone immersed within that system. Much the same occurred in Germany during the Nazi party’s reign. If you were to ask many of the Germans most deeply immersed into the concept the Adolf Hitler had created, they would have done anything for him. That is not to say that cultural manifests are absolutely terrible; there are of course many misuses of these constructs and there examples were they are extremely functional. For example, Gandhi’s use of civil disobedience to alter the current cultural manifest and therefore causing a revolution in India. The complex clockwork that is a cultural manifest is difficult to influence, but once it has been changed, the spread of the alteration is silent and unexpected and soon the entire system has changed. To conclude a cultural manifest is a construct of concepts/ideas that influences societies and groups. 2. If Rawls were to create a portion of a cultural manifest, he would ensure that several concepts were ticking in its construct. Rawls does not see moral desert in a society, rather he argues that people should use their talents to better society. If the talents in a particular person are not required, then they are simply not needed and therefore that person must harness talents that are needed in order to function in society. Additionally, Rawls would allow income disparity on the condition that those on the lowest economic level are aided equally by the income disparity. Furthermore, the cultural manifest would influence early generations into thinking that their skills are needed for society in order for it to function. Therefore, not discriminating based on genetic traits, working conditions, and other “arbitrary” traits that are randomly assigned, behind the veil of ignorance. 3. In Kant’s cultural manifest we find a world where no human can be used as a means. Any entity capable of rational thought is not to be regarded as a means, rather they are ends. Additionally, anytime an entity is used as means, the action must first be tested as a universal law. This means that if everyone in the sphere of existence were to preform this action, there would be no resulting disparity. In other words, if I were to consider borrowing an excessive amount of money for personal gain, I would first wonder what would happen if everybody were to do the same. I would realize (hopefully) that if everyone borrowed an excessive amount of money then there would be no longer any money left in the bank for better purposes, there would be no more money in the bank, and there would massive amounts of household debt which could result in an economic recession. Therefore this action is refuted by universal law and does not fit the categorical imperative. In this society, there is a fairly dogmatic upbringing, in the sense that, one must always follow the categorical imperative and no other reason as it may mislead them. 4. Mill has interesting world where the ends always justify the means. A place where, as long as the ends results in the greatest amount of happiness, the greatest atrocities and the greatest achievements of mankind can occur. You can justify any action, whether requiring personal sacrifice, or populace sacrifice. The main upbringing would involve the eduction of long-term/short-term utils and the comparison of these utils with others. Through this reasoning a person could construct their own ethical decisions and therefore logically come to a conclusion. 5.Who is Dale Carnegie? He was a prominent and persistent admirer of Abraham Lincoln and studied Lincoln’s history throughout his life. He is the author of the best-selling 70 year old book called “How to win friends and influence people.” An unfortunate title for the book as all of the methods would coincide with the categorical imperative. Additionally the book is light-hearted and humorous despite its philosophical depth into human nature. As for Aristotle, he is a well known and cited greek philosopher, and in this post he is going to bring a different aspect other than utilitarianism, the categorical imperative, or the difference principle to the table. Aristotle shines upon teleological reasoning. A telos, goal or purpose is what this system is based upon. In order to analyze a situation, one must first identify the telos of the climate. Say perhaps that we were to identify who to give the best construction tools. First we would have to discuss the purpose of this construction tools. In this case (I would assume) that the purpose of those tools is to build, and therefore, those tools should be given to the best builders. However, there is a problem with teleological reasoning; sometimes, everybody cannot agree on the purpose of a particular situation. The purpose is always up for debate and this can cause massive delays in decision making. What does Carnegie have to do with all of us? Dale Carnegie points out a very important part of human nature, and gives you the tools to control that characteristic. He does not teach you to alter the personalities of others, or how to change the thoughts of others, rather he gives you the tools to change yourself. To bring together the various threads of discussion and dialogue we’ve been engaged in as we work through our initial introductions to the principles of moral reasoning put forth by John Stuart Mill, Immanuel Kant and John Rawls, I’ve collected links to many of the prompts and posts from the unit below. Follow the links in the headings through to the original posts and share your thoughts on the questions and comments emerging in these various discussions. Does a fair procedure justify any result? What is the moral work of consent? In other words, Why does/can consent make the amoral moral? Is it possible to benefit from the oppression of [racial minorities, other genders, classes, regions, religions] and not be deemed responsible for such oppression? If it is possible to be ‘innocent’ in such a case, under what conditions does such innocence exist? …who bears the responsibility to reduce the amount of discrimination and oppression experienced by [indigenous] groups? Should it fall to the oppressed to liberate themselves from a pervasive society of oppression? Or are we all responsible? “The Iowa Supreme Court on Friday stood by its ruling that a dentist acted legally when he fired an assistant because he found her too attractive and worried he would try to start an affair. What do you feel are the merits of these two arguments? Similarly, where do you feel that either of the arguments is vulnerable or weakly articulated? Have you seen others make either case better? Are there further perspectives that these two essays may be leaving out? How might each of these three moral philosophers (Kant, Mill, Rawls) approach these recent events? Are there ways in which they might agree? Where do you see their thoughts on indigenous land claims diverging? Rawls and What is a Fair Start? First of all, what are your impressions of Rawls’ theory next to concepts of Utilitarianism and/or notions of the Categorical Imperative? Second, do you agree that everyone should have the same basic liberties, whether they are a man or a woman, young or old, rich or poor, part of the minority or part of the majority? And if you do, what basic liberties should everyone have? And third, how do you see Rawls’ theory applying to the discussions we have had around systemic oppression in the last week or so? What insights might the theory offer for those looking to combat a misogynistic or racially discriminating culture? Are there other groups or conditions to which Rawls’ insights may oppose? Homo sapiens has long sought to set itself apart from animals — that is, apart from every other living species. One of the most enduring attempts to define humanity in a way that distances us from the rest of animal life was Aristotle’s description of the human being as a “political animal.” By this he meant that human beings are the only species that live in the “polis” or city-state, though the term has often been understood to include villages, communes, and other organized social units. Implicit in this definition is the idea that all other animals are not political, that they live altogether outside of internally governed social units. This supposed freedom from political strictures has motivated some, such as the 19th-century anarchist aristocrat Piotr Kropotkin, to take nonhuman animals as a model for human society. But for the most part the ostensibly nonpolitical character of animal life has functioned simply to exclude animals from human consideration as beings with interests of their own. What might we be missing when we cut animals off in this way from political consideration? For one thing, we are neglecting a great number of solid scientific facts.This supposed freedom from political strictures has motivated some, such as the 19th-century anarchist aristocrat Piotr Kropotkin, to take nonhuman animals as a model for human society. But for the most part the ostensibly nonpolitical character of animal life has functioned simply to exclude animals from human consideration as beings with interests of their own. Change Can be Normal right? “Can normal exist?” is the question I asked in my last blog post. At the time I had come to the conclusion that nothing can ever be normal for nothing can ever be exactly the same. After discussing my topic with a few people and doing some research on Determinism I began to question my own post. What is philosophy without questions? Perhaps I was taking the definition too literally, perhaps I should have considered that normal exists on smaller scales. Sure, one normal culture cannot exist because there are so many and they are all commonly practiced but there are, however, things in a society that can be normal. If we look to the smaller scale gender roles in society can influence whats normal, societies morals can influence what is abnormal and the way people are isolated when they behave in unconventional ways can show what is normal. Why do we as a society prefer to have behavior that is classified as normal? Is it a conscious decision chosen by free will or does “normal” derive from the beliefs of hard determinism? The standard of how boys and girls are expected to act lead to the creation of terms such as this. It brings to question weather we as a society have the right to put labels on people and judge them for their behavior. This labeling, as it would seem, is normal. As a society we are constantly placing people into categories and are amazed when they behave differently from what we expected. It would be abnormal for a person to act out of the traits of their category for they would be going against what is expected of them. It’s in this way that normal can exist. Why do we create these labels, can we get past them? should we even try to? Perhaps the fear of the unknown is society’s number one motivator. We question everything and label everything because we have the innate desire to know everything. I guess that’s normal too. These constraints that society makes can lead to rebellious behavior. People often wish to do as they please, they do not want to be held back by other peoples expectations. The desire to not be “mainstream” has become a mainstream concept. We often desire to be different, to stand out of the crowd and to not conform to societies norms, but that desire makes us quite similar to others. 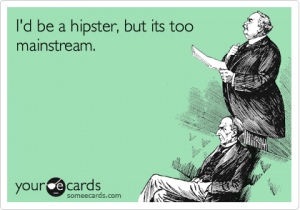 For example the hipster culture started as a life style to avoid being “mainstream” (this being the ideas, attitudes, or activities that are regarded as normal or conventional; the dominant trend in opinion, fashion, or the arts.) As time went on the hipster culture, ironically, became normal. This life style became popular and is now accepted (although not without humor) as a societal label. We have people in society who wish to be different and we have those who wish to fit in better. We are constantly attempting to find our place in society be it through rebellion or through attempts to be “cooler”. At one point in every human’s life they have thought about where they ‘fit into’ the scheme of the world. Are they normal? Do they want to be? Through media and the responses to it we can see that people behave in similar ways. A song about ‘fitting in’ received millions of views on YouTube and became extremely popular because it is something that the majority of people have been able to relate to in some way or another.The definition of normal is the usual, average, or typical state or condition. Wanting to be normal is an average, or typical state or condition when we look at songs like the one linked below. Is the act of being normal an act of free will? 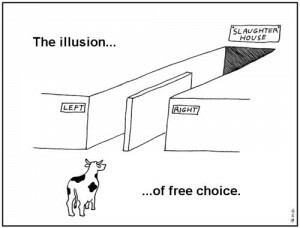 Do we have 100% control over how we choose to behave or is free will an illusion formed for you, not by you? The idea that forces and conditions that were active before one develops the ability to comprehend things, make choices or exercise ones will is the theory of hard determinism. Does free will exist in the sense that we control our own behavior and personalities or do outside forces form it for us? Which of these relates to why humans choose to be normal? Some could argue that normality stems from hard determinism, that we have no real choice in the way that we live and think, thus creating a standard of normal. The forces that determine this lack of conscious free will include your childhood, education, social conditioning, exposure to external events all and more. If we truly do not have free will, perhaps this is where the concept of normal comes from. However existentialists, like Sartre, argued that its up to human beings to define themselves because no blue prints, no moral absolutes and no divine commandments and given values exist to guide peoples decisions on how to live. This lack of guidance, he argues, can lead to moments of existential angst or anxiety. Could then conforming to a societal norm be the result of fear? Do the people who feel “condemned” to be free (as Sartre worded it) conform more easily to the labels of normal because they are more desperate for it? Would Sartre agree that people who do not feel condemned by their freedom are more likely be viewed as abnormal by society? Or would he simply say that people have the free will to choose to behave however they wish and thus normal does not exist? What is it to be normal, does normality exist? As a society we have rules and codes to follow. We have certain ways to view things; certain ideas of what is politically correct and ethically okay. We, as a society have a strong belief in normality. The word normal can be defined as the usual, average, or typical state or condition. What exactly is the usual, average or typical state of condition? How can we measure the usual? How often does something need to occur for it to become a typical state or condition? Our society is run by its belief that everyone should behave and act a certain way. If they don’t conform to that behavior society may reject them, and they are labeled as “strange” and “abnormal”. However, normal does not exist. 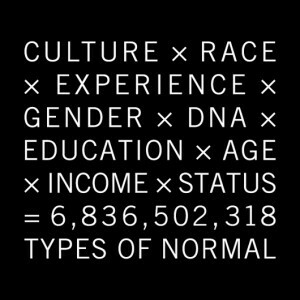 Humans are diverse, we are all different in some way or another so how can you classify us all into a spectrum of norm? This idea of normality is about unquestionable measures of reality and conformity. Humans can be unpredictable, but we try to remove the unpredictability by creating predictable behavior to create guidelines for acceptance and by doing so, we invent the norm. Just as we create the norm, we prove that it cannot truly exist. There are many different cultures around the world that all have their own ways of living, their own beliefs and their own traditions. Cultures can contradict each other; they can be very different from one another. So how can we label any one of them as “normal” when they are all so different? Recall, the definition of normal is the usual, average, or typical state. If we were to calculate the averages of different beliefs of culture, we would end up with classifying cultures like those that exist in Asia as the norm purely because they have the highest population of people who follow that structure. Is then every other culture abnormal? Do we then have the right to say that no other culture is right except for the one with the highest average of followers? Social norms are different around the world. For example, if I were to go to store in Canada not wearing shoes than I would be kicked out, because here the norm is “no shoes, no shirt no service.” However, if I went to a store in my home country, South Africa, without shoes people would not even notice; it would not a big deal in the slightest for people do it all the time. An objective society is impossible to create. Never will every mind agree with every other mind. What is real depends upon our values, and these values depend upon our personality and our experience. If there is a disagreement between society and an individual how do you determine who is right? If you ask one hundred people a simple question worded the exact same way every time no two individuals will respond exactly the same way. How can normal exist when no two people are alike? Psychological diversity is a fact of life and so there cannot be a ‘normal’ person. The craving to be normal is the craving to be average, it stems from the need that each individual has to be accepted and welcomed in their society. Be that as it may, the word in its literal meaning cannot exist. There can never be anything that is truly normal for there can never be any two things that are truly and exactly identical. Today the face-to-face philosophy crowd discussed scientific philosophy and the question of whether science itself can be considered objective. It was the group’s second attempt at facilitating its own ‘teacherless discussion’ and constructing collective knowledge on a topic (I reflected on the first discussion in a post here), and wanted to take the opportunity this weekend to foster some dialogue around the nature of such ‘leaderless’ collaborations. Whether you were a participant in today’s discussion or not, there are a number of factors which limit or inspire individuals’ capacity to contribute to such democratic processes. Possessing prior knowledge, being able to act within previously-decided roles and responsibilities (teacher-student-expert, etc), peer relationships and even the physical arrangement of the discussion environment play a part in whether a social process meets its goals or not. So I arrive here this afternoon with a few questions, chiefly for today’s classroom participants, but potentially those beyond, about how these processes unfold. Are there aspects of discussion which benefit from a lack of predetermined structure? What are they? Or, are there benefits to formalizing or organizing a group in certain traditional ways, for example, designating a leader, prescribing topics or areas of expertise, capturing or introducing different ideas in progress? What is difficult about engaging with a ‘leaderless’ discussion or group process? What causes the discussion or group task to wander, or lose sight of its purpose, or sees people disengage? What causes you to take your phone out, or to chat (off-topic) with a neighbour, or daydream? What is happening in a discussion or group task when you are particularly engaged? When is a discussion at its most productive? And, what constitutes a ‘productive’ discussion? How do we ensure full (or the fullest possible) participation of group members? With careful reflection on the above questions, and by sharing your thoughts with as specific examples or points as possible, we might work toward a clearer focus in our discussions going forward as a group. In analyzing the balance between pragmatism and idealism, we concluded that the most important subject of discussion is the goals of democracy. While we have many different ways to run it, the aim of government is what affects its quality and style the most. As time has progressed, we have seen a dynamic change in the way that we as a society, seek specific goals. As we entered the modern era, we have allowed more room for idealists, and have been awarded then by the goals that we have sought. Our modern government today has approached their democracies in a varieties of ways, but these methods can all be encompassed by two major ideas: pragmatism and idealism. The challenge that our governmental system faces today is how to balance these major pillars of ideology. The direction in which we progress, however, has still been logically and largely pragmatic. This is due to the nature of pragmatic approaches. If we consider pragmatism, which literally means a practical approach, we see that it is simply looking for the best available option. Many issues are solved daily with pragmatism and it has done relatively well so far. Pragmatism, unfortunately, is limited by it’s own definition. When issues are considered in a pragmatic way, whatever changes exacted will be within the current method of thinking. A parochial solution if you will. Not to say pragmatism does not solve problems, but the nature of pragmatism inhibits the growth of idealism and subsequent major developments in the social paradigm. Idealism is, well, idealistic. To seek an idealistic society is to seek the best possible that the system may offer, regardless of its potentiality. Admittedly, there are many great components to this resolution. An idealist would say that why not seek the best possible options? We must aim for the best, in order to attain the best for the citizens of this planet. Idealism would also argue that there must be a catalyst, an instigator for change, in order to make the monumental progress that is possible. How could we possibly know what’s possible, if we don’t try? It parallels the ideas of Kuhn in epistemology, as he suggests we challenge the basis of the paradigms we remain trapped in today. You could say “shoot for the moon and you might just land in the stars”. But a pragmatic approach combats this with a different idea: if you shoot for the moon, you might just end up floating in the middle of space, with nothing accomplished. This is one of the undeniable flaws of idealism, and one of the major points of contention from both sides – what happens when one falls short of the goals presented by idealism? 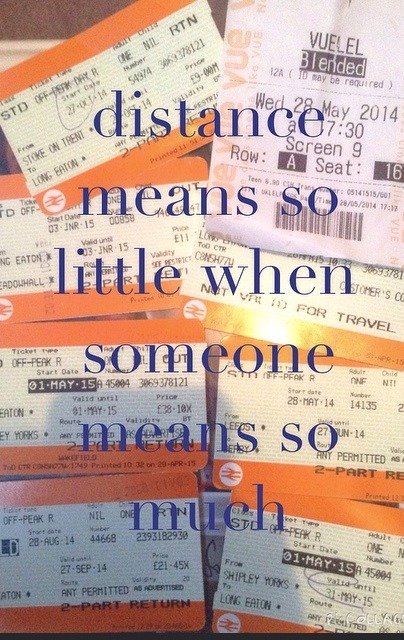 Have they achieved the distance they have covered? Or is it an all-or nothing challenge? Pragmatists have also challenged the idealists in terms of limitations. Is there a potential limitation to the goals you can seek? One could ask: when do the possibilities of ideals end? Human nature can only conform to the ideals of this world to a certain limit. Mengzi once said that “the great man is the one who does not lose his child’s heart” – this goes on to say that all men are eventually corrupted. If so, this means that an idealistic world cannot exist (or only exists to a certain point). This asks the question: when should we stop searching for a greater society? Is there a point when we have reached the peak of our abilities? Furthermore, it is important to note that, due to the differing areas in which pragmatism and idealism may be applied, the answer to which is better depends on the questions you ask and the area you wish to broach. Like Quantum Mechanics if you will. You may be considering these two ideas in terms of their social, political, religious or even moral aspects. The plausibility of these two may change significantly depending on what aspect you are looking from. 1. Should democracy seek idealism or pragmatism? 2. Is there a limit to idealism? 4. Is there a balance between idealism and pragmatism? If so, where is it?